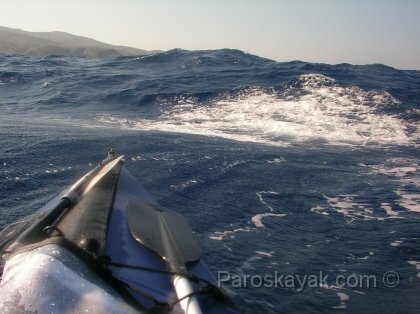 The normal paddling season in the Aegean Sea, and Paros in particular, is from April through to October. The summer has a settled weather pattern that is predictable from year to year. During summer it is extremely dry and hot. Also, in the summer the meltemi blows briskly down through the Aegean at anything from 15 to 40 knots. One should anticipate its maximum during July and August. Usually the wind starts in the early afternoon reaching 4-5 on the Beaufort scale and dies out at sun set. The meltemi is a katabatic wind and the Aegean is full of acceleration zones that funnel the wind producing gnarly waves. It is not uncommon for this katabatic wind to reach force 6-7 gusting 8 (Beaufoft scale) during the day. In fact, some islands are notorious for funneling the Northerly to gale wind speeds. Although, the pattern is predictable , usually the meltemi blows over many days, sometimes even up to two weeks. If during this period paddling cannot be avoided, it can be very wise to start the trip before dawn and to cover most of the mileage before the fresh morning breeze.